Some of you have asked me previously whether or not we can share any test documents to demonstrate Calc’s new OpenCL-based formula engine. Thanks to AMD, we can now make available 3 test documents that showcase the performance of the new engine, and how it compares to Calc’s existing engine as well as Excel’s. These files are intentionally in Excel format so that they can be used both in Calc and Excel. They also contain VBA script to automate the execution of formula cell recalculation and measure the recalculation time with a single button click. All you have to do is to open one of these files, click “Recalculate” and wait for it to finish. It should give you the number that represents the duration of the recalculation in milliseconds. Note that the 64-bit version of Excel requires different VBA syntax for calling native function in DLL, which is why we have a separate set of documents just for that version. You should not use these documents unless you want to test them specifically in the 64-bit version of Excel. Use the other one for all the rest. On Linux, you need to use a reasonably recent build from the master branch in order for the VBA macro to be able to call the native DLL function. If you decide to run them on Linux, make sure your build is recent enough to contain this commit. Once again, huge thanks to AMD for allowing us to share these documents with everyone! This week I have finally finished implementing a true shared formula framework in Calc core which allows Calc to share token array instances between adjacent formula cells if they contain identical set of formula tokens. Since one of the major benefits of sharing formula token arrays is reduced memory footprint, I decided to measure the trend in Calc’s memory usages since 4.0 all the way up to the latest master, to see how much impact this shared formula work has made in Calc’s overall memory footprint. This ODF spreadsheet document contains 100000 rows of cells in 4 columns of which 399999 are formula cells. Column A contains a series of integers that grow linearly down the column. Here, only the first cell (A1) is a numeric cell while the rest are all formula cells that reference their respective immediate upper cell. Cells in Column B all reference their immediate left in Column A, cells in Column C all reference their immediate left in Column B, and so on. References used in this document are all relative references; no absolute references are used. I’ve tested a total of 4 builds. One is the 4.0.1 build packaged for openSUSE 11.4 (x64) from the openSUSE repository, one is the 4.0.6 build built from the 4.0 branch, one is the 4.1.1 build built from the 4.1 branch, and the last one is the latest from the master branch. With the exception of the packaged 4.0.1 build, all builds are built locally on my machine running openSUSE 11.4 (x64). Also on the master build, I’ve tested memory usage both with and without shared formulas. In each tested build, the memory usage was measured by directly opening the test document from the command line and recording the virtual memory usage in GNOME system monitor. After the document was loaded, I allowed for the virtual memory reading to stabilize by waiting several seconds before recording the number. The results are presented graphically in the following chart. The following table shows the actual numbers recorded. Additionally, I’ve also measured the number of token array instances between the two master builds (one with shared formula and one without), and the build without shared formula created 399999 token array instances (exactly 4 x 100000 – 1) upon file load, whereas the build with shared formula created only 4 token array instances. This likely accounts for the difference of 78.3 MiB in virtual memory usage between the two builds. One thing worth noting here is that, even without shared formulas, the numbers clearly show a steady decline of Calc’s memory usage from 4.0 to 4.1, and to the current master. While we can’t clearly infer from these numbers alone what caused the memory usage to shrink, I can say with reasonable confidence that the cell storage rework we did during the same period is a significant factor in such memory footprint shrinkage. I won’t go into the details of the cell storage rework here; I’ll reserve that topic for another blog post. 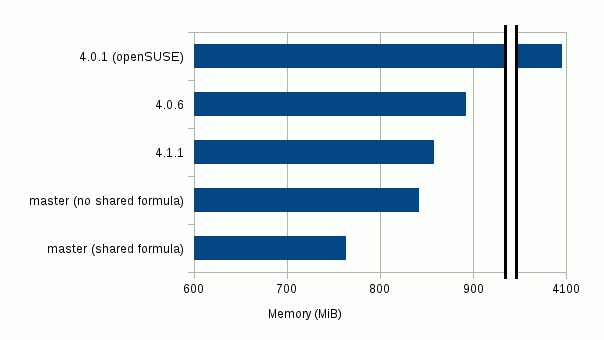 Oh by the way, I have absolutely no idea why the 4.0.1 build packaged from the openSUSE repository shows such high memory usage. To me this looks more like an anomaly, indicative of earlier memory leaks we had later fixed, different custom allocator that only the distro packaged version uses that favors large up-front memory allocation, or anything else I haven’t thought of. Either way, I’m not counting this as something that resulted from any of our improvements we did in Calc core. I spent my entire last week on my personal project, by taking advantage of Novell’s HackWeek. Officially, HackWeek took place two weeks ago, but because I had to travel that week I postponed mine till the following week. Ixion is the project I worked on as part of my HackWeek. This project is an experimental effort to develop a stand-alone library that supports parallel computation of formula expressions using threads. I’d been working on this on and off in my spare time, but when the opportunity came along to spend one week of my paid time on any project of my choice (personal or otherwise), I didn’t hesitate to pick Ixion. So, what’s Ixion? Ixion aims to provide a library for calculating the results of formula expressions stored in multiple named targets, or “cells”. The cells can be referenced from each other, and the library takes care of resolving their dependencies automatically upon calculation. The caller can run the calculation routine either in a single-threaded mode, or a multi-threaded mode. The library also supports re-calculation where the contents of one or more cells have been modified since the last calculation, and a partial calculation of only the affected cells gets performed. It is written entirely in C++, and makes extensive use of the boost library to achieve portability across different platforms. It has currently been tested to build on Linux and Windows. The goal is to eventually bring this library up to the level where it can serve as a full-featured calculation engine for spreadsheet applications. But right now, this project remains as an experimental, proof-of-concept project to help me understand what is required to build a threaded calculation engine capable of performing all sorts of tasks required in a typical spreadsheet app. I consider this project a library project; however, building this project only creates a single stand-alone console application at the moment. I plan to separate it into a shared library and a front-end executable in the future, to allow external apps to dynamically link to it. The FILE must contain the definitions of cells according to the cell definition rule. -h [ --help ]         print this help. -t [ --thread ] arg   specify the number of threads to use for calculation. corresponds with the number of calculation threads i.e. those child threads that perform cell interpretations. used by this program will be arg + 2. Usage: ixion-parser [options] FILE1 FILE2 ... The FILE must contain the definitions of cells according to the cell definition rule. Allowed options: -h [ --help ] print this help. -t [ --thread ] arg specify the number of threads to use for calculation. Note that the number specified by this option corresponds with the number of calculation threads i.e. those child threads that perform cell interpretations. The main thread does not perform any calculations; instead, it creates a new child thread to manage the calculation threads, the number of which is specified by the arg. Therefore, the total number of threads used by this program will be arg + 2.
init – initialize cells with specified contents. result – pick up expected results for cells, for verification. edit – modify cell contents. 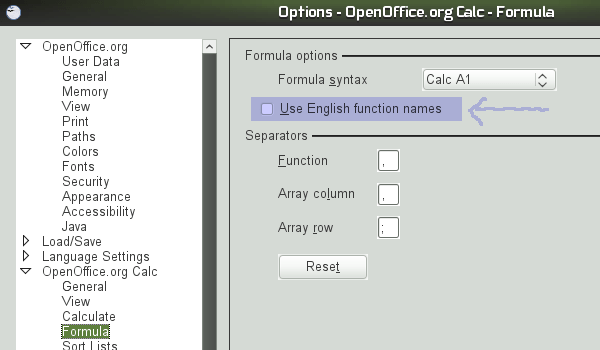 calc – perform full calculation, by resetting the cached results of all involved cells. recalc – perform partial re-calculation of modified cells and cells that reference modified cells, either directly or indirectly. check – verify the calculation results. Given all this, let’s see what happens when you run the parser with the above cell definition file. Notice that at the beginning of the output, it displays the number of threads being used, and the number of “CPU”s it detected. Here, the “CPU” may refer to the number of physical CPUs, the number of cores, or the number of hyper-threading units. I’m well aware that I need to use a different term for this other than “CPU”, but anyways… The number of child threads to use to perform calculation can be specified at run-time via -t option. 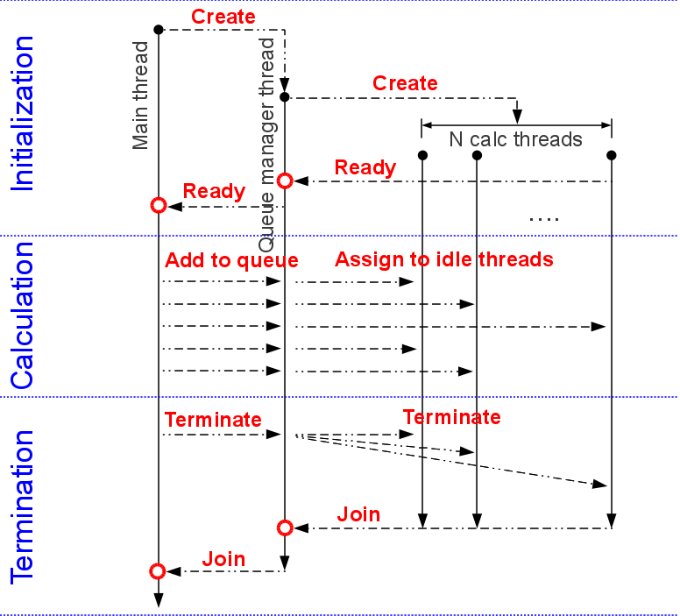 When running without the -t option, the parser will run in a single-threaded mode. Now, let me go over what the above output means. The first calculation performed is a full calculation. Since no cells have been calculated yet, we need to calculate results for all defined cells. This is followed by a verification of the initial calculation. After this, we modify cell A6, and perform partial re-calculation. Since no other cells depend on the result of cell A6, the re-calc only calculates A6. Now, the third calculation is also a partial re-calculation following the modification of cell A1. This time, because several other cells do depend on the result of A1, those cells also need to be re-calculated. The end result is that cells A1, A2, A3, A4, A5 and A6 all get re-calculated. There are several technical aspects of the implementation of this library I’d like to cover. The first is cell dependency resolution. I use a well-known algorithm called topological sort to sort cells in order of dependency so that cells can be calculated one by one without being blocked by the calculation of precedent cells. Topological sort is typically used to manage scheduling of tasks that are inter-dependent with each other, and it was a perfect one to use to resolve cell dependencies. 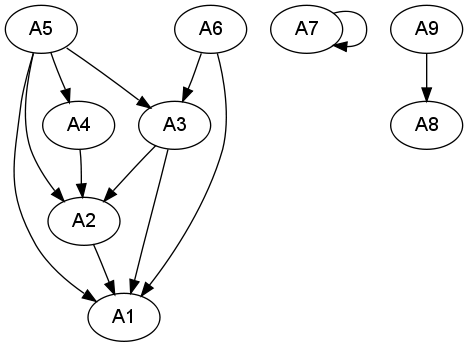 This algorithm is a by-product of depth first search of directed acyclic graph (DAG), and is well-documented. A quick google search should give you tons of pseudo code examples of this algorithm. This algorithm work well both for full calculation and partial re-calculation routines. The heart of this project is to implement parallel evaluation of formula expressions, which has been my number 1 goal from the get-go. This is also the reason why I put my focus on designing the threaded calculation engine as my initial goal before I start putting my focus into other areas. Programming with threads was also very new to me, so I took extra care to ensure that I understand what I’m doing, and I’m designing it correctly. Also, designing a framework that uses multiple threads can easily get out-of-hand and out-of-control when it’s overdone. So, I made an extra effort to limit the area where multiple threads are used while keeping the rest of the code single-threaded, in order to keep the code simple and maintainable. As I soon realized, even knowing the basics of programming with threads, you are not immune to falling into many pitfalls that may arise during the actual designing and debugging of concurrent code. You have to go extra miles ensuring that access to thread-global data are synchronized, and that one thread waits for another thread in case threads must be executed in certain order. These things may sound like common sense and probably are in every thread programming text book, but in reality they are very easy to overlook, especially to those who have not had substantial exposure to concurrency before. Parallelism seemed that un-orthodox to conventional minds like myself. Having said all that, once you go through enough pain dealing with concurrency, it does become less painful after a while. Your mind can simply adjust to “thinking in parallel”. Back to the topic. I’ve picked the following pattern to manage threaded calculation. First, the main thread creates a new thread whose job is to manage cell queues, that is, receiving queues from the main thread and assigning them to idle threads to perform calculation. It is also responsible for keeping track of which threads are idle and ready to take on a cell assignment. Let’s call this thread a queue manager thread. When the queue manager thread is created, it spawns a specified number of child threads, and waits until they are all ready. These child threads are the ones that perform cell calculation, and we call them calc threads. Each calc thread registers itself as an idle thread upon creation, then sleeps until the queue manager thread assigns it a cell to calculate and signals it to wake up. Once awake, it calculates the cell, registers itself as an idle thread once again and goes back to sleep. This cycle continues until the queue manager thread sends a termination request to it, after which it breaks out of the cycle and reaches the end of its execution path to terminate. The role of the queue manager thread is to receive cell calculation requests from the main thread and pass them on to idle calc threads. It keeps doing it until it receives a termination request from the main thread. Once receiving the termination request from the main thread, it sends all the remaining cells in queue to the calc threads to finish up, then sends termination requests to the calc threads and wait until all of them terminate. Thanks to the cells being sorted in topological order, the process of putting a cell in queue and having a calc thread perform calculation is entirely asynchronous. The only exception is that when referencing another cell during calculation, the result of that referenced cell may not be available at the time of the value query due to concurrency. In such cases, the calculating thread needs to block its execution until the result of the referenced cell becomes available. When running in a single-threaded mode, on the other hand, the result of a referenced cell is guaranteed to be available as long as cells are calculated in topological order and contain no circular references. Had I had to do all this in my spare time alone, it would have easily taken months. So, I’m very thankful for the event, and I look forward to having another opportunity like this in hopefully not-so-distant future. So, what lies ahead for Ixion? You may ask. There are quite a few things to get done. Let me start first by saying that, this library is far from providing all the features that a typical spreadsheet application needs. So, there are still lots of work needed to make it even usable. Moreover, I’m not even sure whether this library will become usable enough for real-world spreadsheet use, or it will simply end up being just another interesting proof-of-concept. My hope is of course to see this library evolve into maturity, but at the same time I’m also aware that it would be hard to advance this project with only my scarce spare time to spend in. With that said, here are some outstanding issues that I plan on addressing as time permits. Add support for literal strings, and support textural formula results in addition to numerical results. Add support for empty cells. Empty cells are those cells that are not defined in the model definition file but can still be referenced. Currently, referencing a cell that is not defined causes a reference error. Add support for cell ranges. This implies that I need to make cell instances addressable by 3-dimensional coordinates rather than by pointer values. Split the code into two parts: a shared library and an executable. Use autoconf to make the build process configurable. Make the expression parser feature-complete. Implement more functions. Currently only MAX and MIN are implemented. This concludes my HackWeek report. Thank you very much, ladies and gentlemen. Today, I’d like to talk about two minor enhancements I just checked in to ooo-build master. They are not really earth-shuttering per se, but still worth mentioning & may be interesting to some users. Here is the first enhancement. In Calc, you’ll see a new tab at the right end of the sheet tabs, to allow quick insertion of new sheets. Each time you click this tab, a new sheet gets inserted to the right end. The sheet names are automatically assigned. 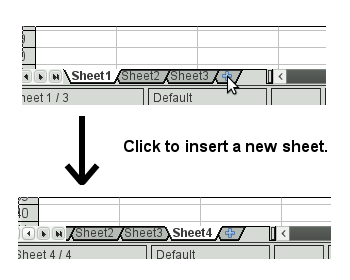 Previously, inserting a new sheet has to be done by opening the Insert sheet dialog, selecting the position of the new sheet and how many new sheets are to be inserted etc. But if you always append a single sheet at the right end and don’t care to name the new sheet (or name it after the sheet is inserted), this enhancement will save you a few clicks. Implementing this was actually not that hard since I was able to re-use the existing code for most of its functionality. I personally wanted to give it a little more visual appeal, but that will be a future project. Anyway, I hope some of you will find this useful. The second enhancement is related to cell functions. If you use a localized version of OOo, you probably know that the function names are localized. But there has been quite a few requests to support English function names even if the UI is localized. This is where this enhancement comes in. By default, the check box is off, which means the localized function names are used. Checking this check box will swap localized function names with the English ones across the board. You can of course uncheck it to go back to the localized function names. As always, please test this thoroughly, and report any bugs. Thanks!